Radish, though I buy this vegetable, almost every week, I have posted only a few dishes with it, the reason being, I use it only in a couple of dishes, most of the time, in a sambar, stir fry or parathas. For a change, I wanted to try out a dal with this vegetable. 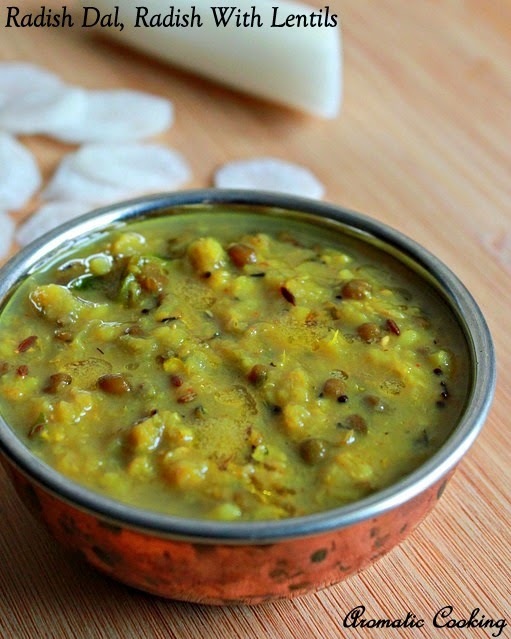 I have used split moong dal ( green gram ) with skin, it's a very simple dish, using basic ingredients in the Indian kitchen, goes very well with rotis and rice and a nice way to sneak in the vegetable, the kids would never be able to pick it out..
Pressure cook the split moong dal ( green gram ) and keep. Heat some oil, add the cumin seeds, when it starts sizzling, add the green chilly, grated ginger, turmeric powder and asafoetida and mix for half a minute, then add the grated radish. Saute it well on medium heat, till the moisture from the radish is all absorbed, then add the coriander powder and garam masala and mix it for a few seconds. Then add the cooked dal/ lentils, about 11/2 to 2 cups of water and the amchur powder. Let the dal simmer for 5 to 7 minutes and remove. I haven't used tomatoes in the dal, you can use it and leave out the amchur powder ( dry mango powder, available in Indian groceries ). Can make the dal slightly thin and have it as a soup too. Can use ghee instead of oil for a nice flavor and if you want the dal more spicy, can add some chilly powder along with the turmeric powder. Perfect with Roti or Rice, nice clicks!! 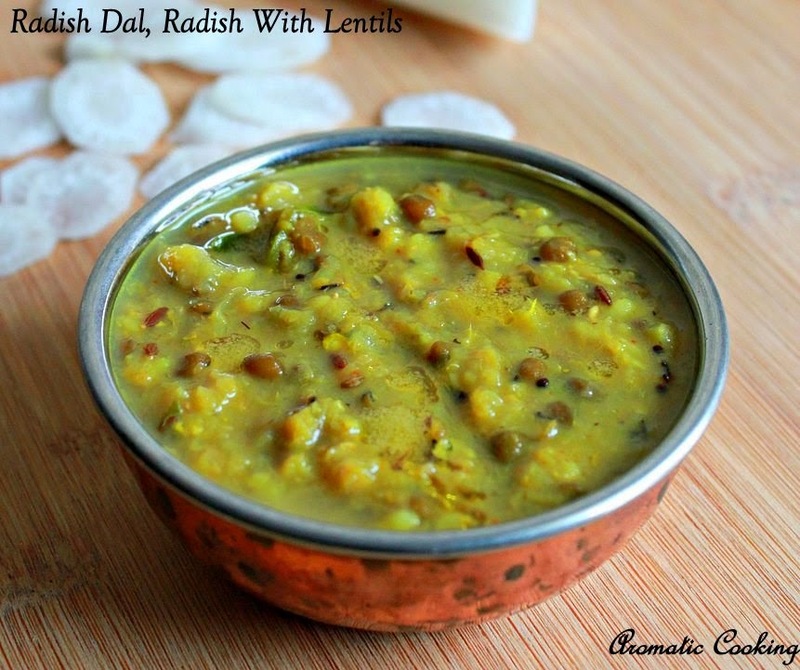 Oh you grated the radish thats why i couldnt see it :) .Lovely dal. looks yumm.. would make a perfect side dish for roti.. Very different and definitely a health dal. Very flavourful and delicious! Great with some homemade flatbread for the lunch. very different recipe,perfect side dish for roti! !